Torque reaction arms and tool suspension systems allows a flexible workspace where traditional fixtured tools will not reach and where operator health and safety is a concern. The Arm absorbs torque reaction generated by the attached assembly tool allowing for smooth, comfortable movement by the operator. This solution eliminates the need for holding a tool during the fastening process with a close to zero-gravity handling force. This system may also be enhanced with a superior error-proofing system, Position Recognition System that tracks the exact position of the tool, ensuring the correct fasteners are tightened to a specified torque, in the proper sequence. â€¢Â Â Â Available in many sizes and torque ranges. â€¢Â Â Â Eliminates the need for an operator holding a tool during an entire shift for fastening operations reducing impact on health and safety. 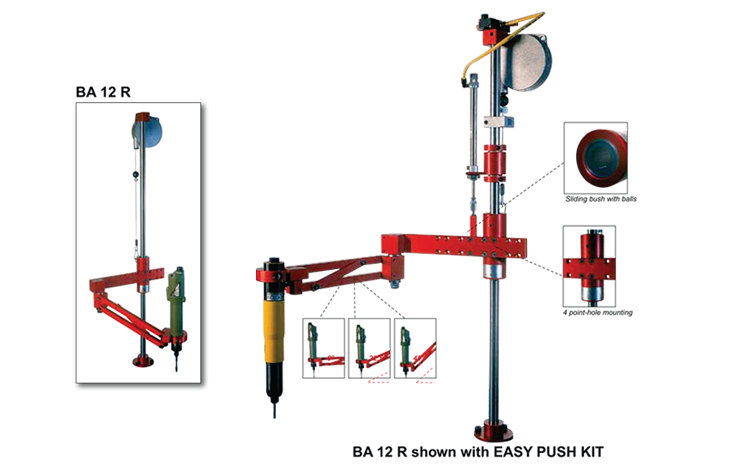 â€¢Â Â Â Enables use of heavy high torque tools without concerns of lifting and holding the tool. â€¢Â Â Â Low operating forces minimizes operator impact. â€¢Â Â Â Left or right hand configuration available with adjustable heights of articulated arm and tool position allows for maximum customization to the application workspace. â€¢Â Â Â Option for a Position Recognition System gives the additional benefit of ensuring a quality fastening process while error-proofing during the operation.